"Would you like to supersize that ma'am?" OK that's 2 triples with cheese 1 Lg fri 1 Lg bowl of chili and a DIET COKE! 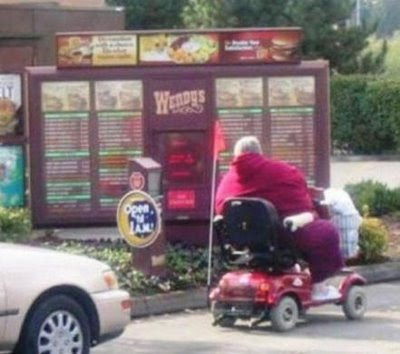 Quirky: She'd better soon supersize that scooter! Trukindog: Oh, yeah, gotta have that diet drink ya know. We're watchin' our weight! MonkAre: Thanks for the kind comments. Come back soon!